“There be dragons to discover at Delamere! Particularly rare ones! This part of Mid Cheshire has an abundance of wildlife to spot, beautiful woodland songbirds to hear and very special plants and fungi to see. 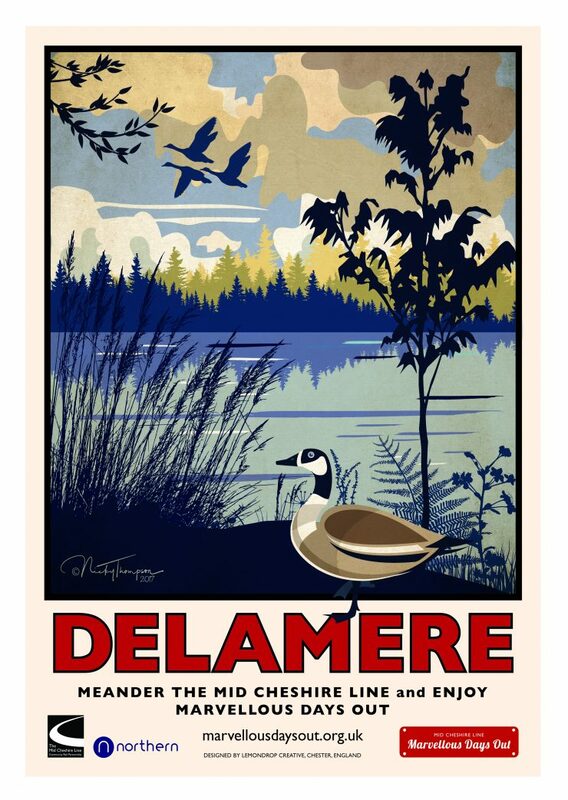 Whenever I mention Delamere to my grandson William he always talks about the fantastic school trip they made to Delamere on the train. Getting our children out on the train and learning about Cheshire’s rural escapes is one of our Community Rail Officer’s key objectives. Certainly, beats the biology lessons I had at school! Delamere station, with its superb station café, is situated in the heart of Delamere Forest – Cheshire’s largest woodland. The forest is a place for families to let off steam, escape the crowds and offers a variety of outdoor pursuits. Delamere Forest, once a royal hunting ground in Norman times and now a haven for wildlife, is managed and sustained by The Forestry Commission. The GoApe Tree Top Adventure is less than a five-minute walk from the station. With its long zip wires and panoramic views, this provides a unique, exciting trek through the tree-tops. For all your information, the Forestry Commission Visitor Centre and Café is a 15-minute stroll from the station. Food made from local sources and fresh roasted coffee is their speciality. The TRACS Delamere Bike Shop & Hire has a variety of top-spec bikes and equipment suitable for families and enthusiasts. Whilst at the Forest, the Cheshire Wild Life Trust invites you to take a look at wildlife close up by checking out the plants and animals living in and around the meres and mossland. The mosses are home to many rare species. Depending on the season, look out for the green hairstreak butterfly or the azure damselfly in the sphagnum moss. And if time permits take the stroll up Old Pale Hill. From there you can see Cheshire, Derbyshire, Lancashire, Shropshire, Staffordshire, Denbighshire and Flintshire.